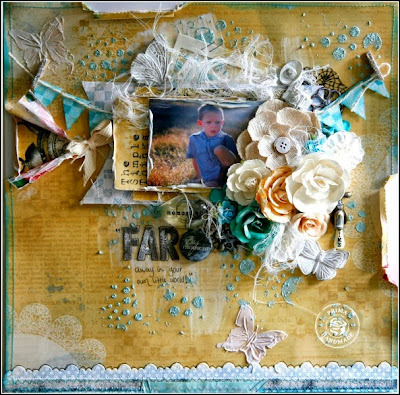 Erin Blegen: My Scrap Cabin: Prima Marketing: Scraplift! Today some of the Prima team members are scraplifting a Prima veteran: Felicity Wilson! Some days, you take out the camera and got nothing. And then others- you get something great. I captured this great photo of Wyatt playing with his football recently- and couldn't wait to scrap it. Such a handsome boy- turning into a little man right before my eyes! I attempted to adhere to her overall design and made a few changes to make it "my own". The large pennant was turned vertically to better support my portrait photo, I applied some gesso and masking to my background and kept the banners and title placement. I added lots of amazing Prima embellishments, both old and new. *NEW* 846251- Allstar Collection "Depth Chart"
*NEW* 846213- Allstar Collection "MVP Allstars"
*NEW* 846237- Allstar Collection "Memorabilia"
*NEW* 971106- All About Me Collection "Dotty"
Such a cute photo of your little man. Great scraplift...you succeeded in putting your unique stamp on it. What an awesome boy lay-out! I love how you took inspiration from Felicity's design and really made it your own! Its gorgeous Erin and I'm sure Felicity would love your scraplift. I especially love the layers and flower cluster. A beautiful scraplift, which I think is very difficult. But you followed the page and managed to make it your style. A flowercluster and still keep it "boyish"is another thing I like! Oh both of you are amazing scrappers, so many wonderful details and layers.. love both layouts..
You did an awesome job! Love your layout!! Gorgeous lift, Erin!! Really love all of those layers you added behind your photo! Your layout and lift are fantastic! Love this one Erin, I just love how you do flowers and make it still look masculine, the fun pennants and layers are beautiful! !